Send flowers to Peru with daFlores and literally experience the best. Providing on-time delivery with garden-fresh blooms, our florists in Peru have years of experience and passion for their craft. When you arrange flower delivery in Peru with daFlores, your loved ones will be absolutely delighted with what you send, every time. When you send flowers to Peru with daFlores, you take advantage of our years of experience. We visit all of our international florists individually, and make sure they meet our stringent criteria. We won't work with florists in Peru unless they've been in business at least a decade and always bring in fresh flowers every morning. There is no recycling when you arrange daFlores flower delivery in Peru. Of course, our florists have plenty of raw materials to go on. The flowers in this fascinating country are absolutely sublime, and form a huge part of Peruvian culture. We don't know if you've noticed, but you'll always see flowers in hair, on balconies and on clothing here: Blossoms and Peru go hand-in-hand. What do you notice when you think of Peru? Florists in Peru? We'd hazard a guess that you don't think of the florists in Peru when the country springs to mind. So, what does spring to mind? The world-famous Machu Picchu? The soaring Andes Mountains? These are all part of the rich heritage this country brings. Peru was home to one of the very earliest human civilizations in South America, the Norte Chico, followed by, among others, the Incas and the Spanish. All of this translates into a country with deep and varied roots, with plenty of crafts and culture to go along with it. But when we at daFlores hang out here, we do think of our florists in Peru. They have enormous riches from which to gather blossoms, which makes it a delight for us to bring you flower delivery in Peru. How daFlores makes your flower delivery in Peru work daFlores works with one florist in each major city. 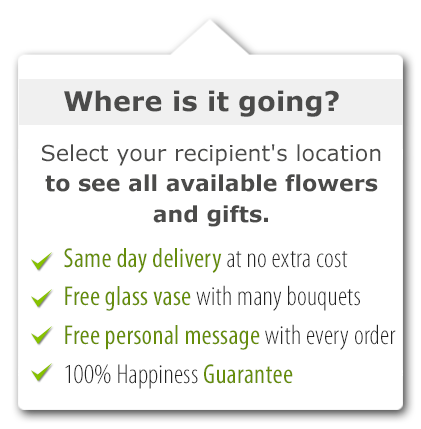 We take the order through our easy-to-use website, and transmit the order to that international florist. They take care of the rest, and it's usually possible to arrange same-day delivery. Because we only work with one florist in each Peruvian city, we ensure their full and undivided attention. Everyone is part of a working team with the utmost respect for you and high standards of communication. We back up our service with bilingual customer service, both online and offline. Then there's that satisfaction guarantee we mentioned. If you're not utterly delighted with your flower delivery in Peru, we'll work with you until you are. Period. While Peru might supply you with awesome Tropical Flowers, that's not all that's available here. The presence of the Andes provides for cold-climate flora and fauna too, all watched by the soaring condors and wild guinea pigs. The tact and knowledge of our international florists means that we should be your first choice for all flowers, including our tasteful and beautiful range of tribute flowers for funerals. Whenever you have loved ones overseas, whether the links are familial or romantic, our roses and other flowers make for a wonderful flower delivery in Peru. It's easy for you to send flowers to abroad, and you can even add on extras for a truly personalized gift. When you work with daFlores florists in Peru, we can guarantee you that you'll never look back. Sending flowers for special holidays is a great way to show that you are thinking about your loved ones. Mother's Day in Peru is the perfect time to take advantage of our service and make sure that a beautiful arrangement makes it to their door in time for the holiday. This year you can send fresh, beautiful flowers in time to make their day even better. Same Day Flower Delivery to all cities in Peru. Para ver esta página en Español, favor visitar nuestra página de Enviar Flores a Perú.